Why can JHSF pipe heating cable give you a safe, healthy energy saving and durable water pipe? The self regulating heating core continuously adjusts its heat output to the environment at every point along the heating cable, thus the overall energy cost for the season is much lower. Energy-efficient. JHSF pipe heating cable was approved by ETL. Pre-assemble pipe heating cable make installation easy for do-it-yourselfers. The plug, thermostat, end seal, self regulating heating cable were pre-assembled. More efficient, reliable and saving money. 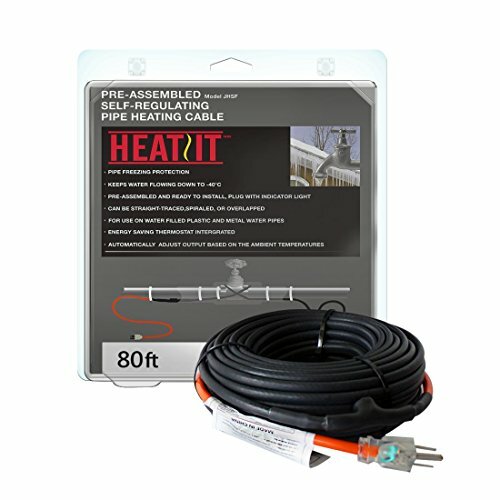 Self regulating heating cable: no worry about any potential fire hazard due to the overheat. More safe than other non self regulating heating cable. JHSF can be straight-traced, spiral , or overlap. Especially for better protected the valve. It can be used on water filled plastic and metal water pipes. It will be more convenient in your job. 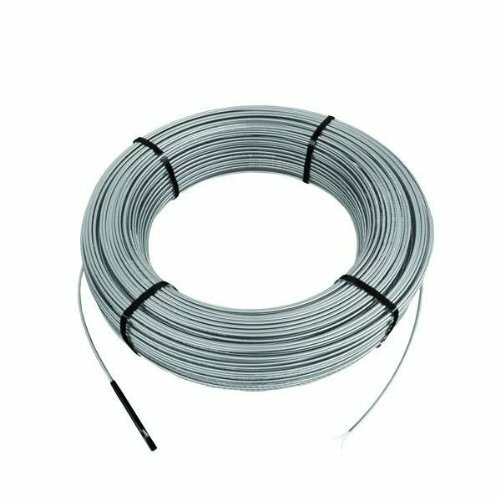 Each Cable consists of tough thermoplastic inner insulation, a continuous ground braid and weather resistant thermoplastic out jacket. 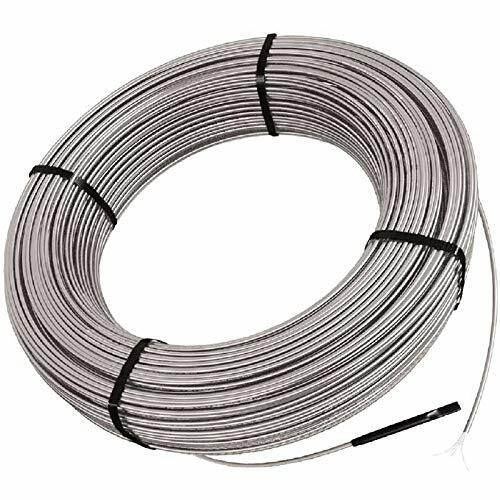 In the connection, JHSF takes the industrial grade heat shrinkage tube technology to make the cable more durable. How about the manufacturer? The factory meet ISO9001 standard (audit by BV)in the production process and the company take a very strict requirement on the incoming material, production process control, finish good inspection etc. Advanced product structure engineering design, good raw material, strict production process, strict internal management plus many years maneuvering experience make HISD more reliable. Warning Never alter or cut the length of the heating cable in any way. Any alteration may result in electrical shock or fire. Cable should not run through the building walls, ceilings or floors. Never use metal binding to secure heating cable to pipe. HEATIT is registered Trademark by zhukeshi(We didn't authorize other sellers in Amazon.com). Suitable for use on rigid plastic and metal water pipes. ( including inlet pipe,drain pipe, sewer , palm tree frost protection etc). Protect pipes up to 1.5" in diameter. For a better freeze protection, at least 1/2 inch thick insulation material is recommended, especially for extremely cold weather. Industrial grade self regulating heating cable. The cable output will adjust automatically based on the ambient temperature at each point along the cable. No worry about the overheat risk. More Safe. Can be used by straight, spiral and overlap. More functional. Pre-assembled, easy to install. Including grounded plug with light, built in thermostat(turn the cable 37F on 50F off), and instructions. Easy to install and use. 120 volt, 3 watts/ft at 50 degrees F. Energy-efficient. Why can HISD pipe heating cable give you a safe, healthy energy saving and durable water pipe? The plug of HISD owned the indication light to show you whether there is electricity or not. With the build in thermostat, you can save more energy. HISD pipe heating cable was approved by both CSA and ETL. You can have more confidence on the product safety. Pre-assemble pipe heating cable make installation easy for do-it-yourselfers. HISD owned the aluminum foil and the tinned copper braid to make sure the 100% screen rate to make the product more healthy and more stable. In the connection, HISD take the industrial grade heat shrinkage tube technology to make the cable more durable. How about the manufacturer? The factory meet ISO9001 standard (audit by BV)in the production process and the company take a very strict requirement on the incoming material, production process control, finish good inspection etc. Advanced product structure engineering design, good raw material, strict production process, strict internal management plus many years maneuvering experience make HISD more reliable. Application tips The HISD is pre-assemble and easy to install, protect the pipe diameters up to 1. 5" from freezing. You can choose different lengths based on the chart in the instruction. Warning Never allow heating cable to touch, cross or overlap itself at any points. No crossing. No spiraling. Never install heating cable on plastic pipe unless pipe is filled with water all the times. Do not install the same cable on more than one pipe. While it is coiled, never plug in the heating cable. 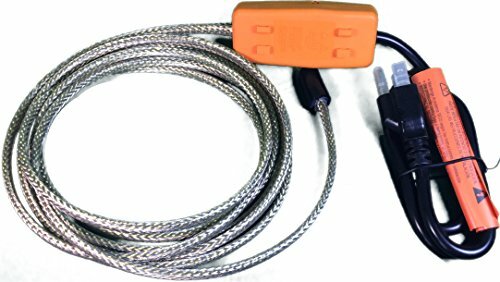 Never alter this heating cable in any way. The thermostat and the entire heating cable has to be in contact with the pipe. Combustible material must not be within 1/2 in. of completed installation. Never use metal binding to secure heating cable to pipe. Use for water filled plastic (including PEX) or metal pipes. Not use for anything else, like empty water pipes, fuel lines, hoses, gutters, steam lines and so on. Two year limited quality warranty. If you are not completely satisfied with HEATIT heating cable, please don't hesitate to contact our customer service in any time, we'll try our best to solve your issues. Pre-assembled easy to install. Including grounded plug with light, built in thermostat, and instructions. Easy to install and use. 120 volt, 7 watts/ft. Built in thermostat to turn the cable 37F on 50F off. Only use 5 amps or less of electricity. Energy saving. 100% screen rate with the Aluminum foil and tinned copper braid. Both CSA and ETL approved. Industrial grade heat shrinkage tube for connection. Tough XLPE as inner insulation and weather resistant PVC (high-low temperature) as out jacket. Maximum 1/2 in fiberglass insulation was used over the heating cable for lower temperature protection. Pipes must be at least 3 feet and at least 3/8'' and less than 1 1/2'' in. diameter. No crossing. No spiral. No overlap itself. Only straight. Testing the cable before the installation. Uncoil the cable, plug in the heating cable and then put the thermostat part of the cable into an ice bucket for few minutes. When the temperature is below 37F, the thermostat will energize the cable to work. Normally you can feel the slight warm on the heating cable in few minutes. To avoid the overheat, please don't plug in the cable for a long time for testing. When you feel the slight warm, please turn it off. Never allow heating cable to touch, cross or overlap itself at any points. No crossing. No spiraling. Never install heating cable on plastic pipe unless pipe is filled with water all the times. 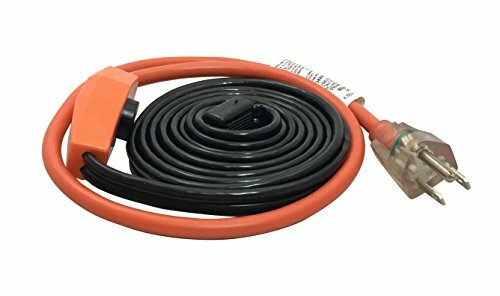 Never alter this heating cable in any way. Schluter-DITRA-HEAT is a modern, advanced under-tile floor heating system. A significant refinement on the underfloor heating systems from the last decade, it is thicker, easier to install, and is entirely waterproof. This is a roll of the heating wire used with the new DITRA-HEAT system. It is designed to be laid into the DITRA-HEAT underfloor tile membrane, and works with DITRA-HEAT thermostats to provide gentle, even heat to the tile it has been laid under. Product Features Strong and Robust Cable Schluter-DITRA-HEAT heating cables are very well manufactured, and have the durability they need to stand the test of time. Versatile Layout The cables can be laid in nearly any layout imaginable inside of the DITRA-HEAT membrane sheets, allowing you to fit your radiant floor perfectly to your tiled room's layout. No Clips or Fasteners Needed The heating cables lock into the DITRA-HEAT membrane without any other accessories or tools, making clips, fasteners, and other wire stabilizers a thing of the past. Pre-Cut Roll of Easy Heat Self Regulating Heating Cable! Plug Head & End Caps Pre-Installed! HEATIT is registered Trademark by zhukeshi(We didn't authorize other sellers in Amazon.com. ).Suitable for use on rigid plastic and metal water pipes. ( including inlet pipe,drain pipe etc). Protect pipes up to 1.5" in diameter. For a better freeze protection, at least 1/2 inch thick insulation material is recommended, especially for extremely cold weather. 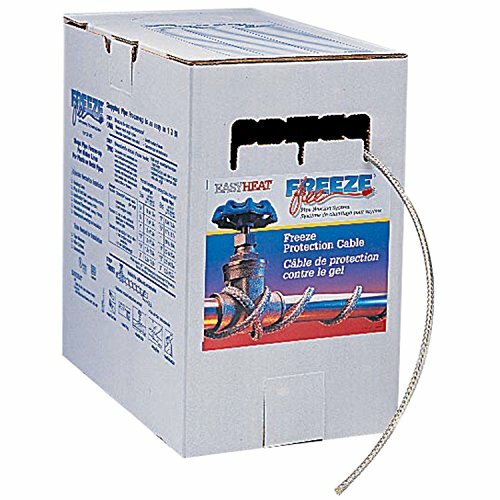 EasyHeat Freeze Free self-regulating pipe heating cables provide flexible protection against pipe freeze-ups in the most challenging applications. The cut-to-length technology is ideal for installations that require protection of numerous pipes of varied lengths. The self-regulating effect of the cable reduces power consumption when the pipe does not require freeze protection. They are ideal for use on residential metal or plastic water supply and drain pipes subject to freezing temperatures; water supply lines underneath manufactured homes; and cottages, barns and outbuildings that are not regularly used. Use for water filled plastic (including PEX) or metal pipes. Not use for anything else, like empty water pipes, fuel lines, hoses, gutters, steam lines and so on. Two year limited quality . If you are not completely satisfied with HEATIT heating cable, please don't hesitate to contact our customer service in any time, we'll try our best to solve your issues. Our Pipe Heating Cable & ICE MELTING CABLE prevents your pipes from major repair costs due to snow or water demage. 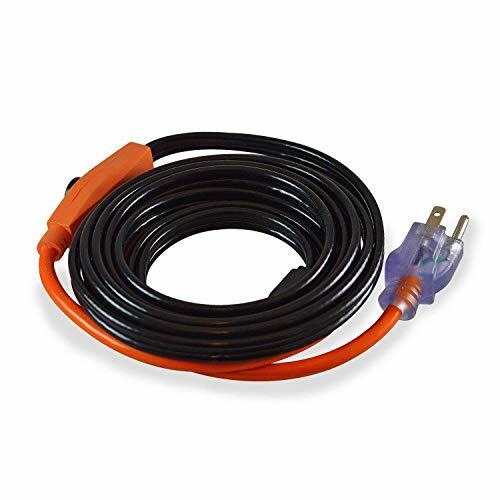 Start saving your pipes and money with our heating Cable. This quick and easy snow melting kit is ideal for indoor and the outdoor use. Winter and Subzero resistant, long-lasting and very durable due to its unique material composition. This Kit prevents congestions and ice backups. The ice breaker cable is easy to install using the included mounting hardware and will operate for years without requiring maintenance. HOW IT WORKS Installing our Ice Free De icing Kit is quick and easy, Just wrap around the pipe and done. Ice Free Pipes in minutes! APPLICATION AREA House, Garage, Pipes, Outdoor Wiring, Windows, Garden, Patio and many more! INCLUDES Heating Cable Comprehensive owners manual ABOUT US Garden HOME stands for highest quality to the lowest price. We give 30 days MONEY BACK PROMISE! if you are not 100% satisfied! Important Instruction: We also have size of the same product in 3ft (B015GH8PZS), 3ft two pack (B01LP151LK), 6ft, 6ft two pack (B01LP277QG) and 9 ft. (B015JXDPAO) Please be sure to order the exact size that you need. Please search for the bracketed ASIN on to find the exact size listing. SECURED PROTECTION, from 9-11 feet (2. 74-3. 35 m) and up to 1-1 1/2 inches (25. 4-38. 1 mm) in diameter. EASY INSTALLATION, just put our Icebreaker cable along the pipes to keep ice and coldness away (Recommended for use on water-filled metal and rigid plastic pipes). ENERGY SAVING, THERMOSTAT CONTROLLED, the built-in thermostat can sense the temperature of the pipe. 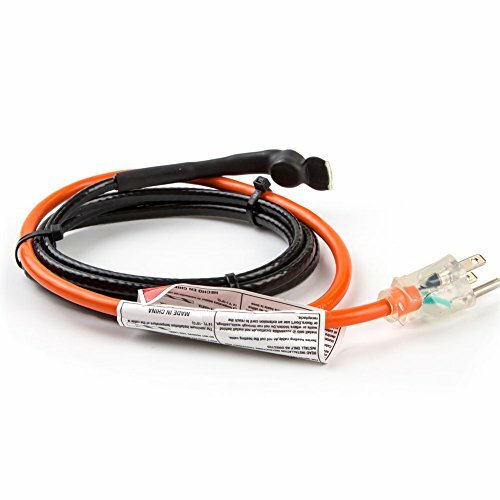 It turns the cable on at 38 F and turns it off automatically when the pipe has been heated to a temperature of approximately 45 F.
ECONOMICAL, reliable low wattage design saves up to 70% energy than other cables and protects your cable to -50 F.
DURABLE, weather resistant PVC outer jacket and inner insulation. It will operate for years without requiring maintenance. Our Pipe Heating Cable & ICE MELTING CABLE prevents your pipes from major repair costs due to snow or water damage. Start saving your pipes and money with our heating Cable. This quick and easy snow melting kit is ideal for indoor and the outdoor use. Winter and Subzero resistant, long-lasting and very durable due to its unique material composition. This Kit prevents congestions and ice backups. The ice breaker cable is easy to install using the included mounting hardware and will operate for years without requiring maintenance. HOW IT WORKS Installing our Ice Free De icing Kit is quick and easy, Just wrap around the pipe and done. Ice Free Pipes in minutes! APPLICATION AREA House, Garage, Pipes, Outdoor Wiring, Windows, Garden, Patio and many more! INCLUDES Heating Cable Comprehensive owners manual ABOUT US Garden HOME stands for highest quality to the lowest price. We give 30 days MONEY BACK PROMISE! if you are not 100% satisfied! SECURED PROTECTION, protects pipes from 3-5 feet (0.91-1.52 m) and up to 1-1 1/2 inches (25.4-38.1 mm) in diameter. EASY INSTALLATION, just put our Icebreaker cable along the pipes to keep ice and coldness away (Recommended for use on water-filled metal and rigid plastic pipes). Grounded cord and plug. DHEHK12043 120V ( 42.7 Ft ) 540W Schluter-DITRA-HEAT is a modern, advanced under-tile floor heating system. A significant refinement on the underfloor heating systems from the last decade, it is thicker, easier to install, and is entirely waterproof. This is a roll of the heating wire used with the new DITRA-HEAT system. It is designed to be laid into the DITRA-HEAT underfloor tile membrane, and works with DITRA-HEAT thermostats to provide gentle, even heat to the tile it has been laid under. Product Features Strong and Robust Cable Schluter-DITRA-HEAT heating cables are very well manufactured, and have the durability they need to stand the test of time. Versatile Layout The cables can be laid in nearly any layout imaginable inside of the DITRA-HEAT membrane sheets, allowing you to fit your radiant floor perfectly to your tiled room's layout. No Clips or Fasteners Needed The heating cables lock into the DITRA-HEAT membrane without any other accessories or tools, making clips, fasteners, and other wire stabilizers a thing of the past. 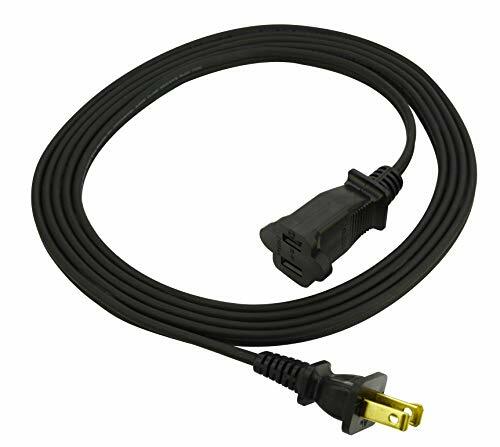 8-Feet extension cord for heat producing appliances such as irons. 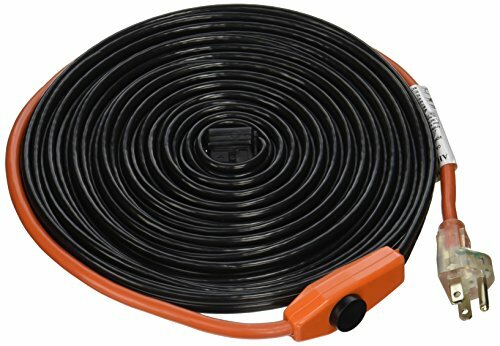 Description Say goodbye to frozen pipes in the winter with the GardenHome Pipe Heating Cable - 6 ft. (1.83 m). This temperature-controlled cable runs along pipes and valves, thawing frozen pipes. The built-in thermostat will sense the temperature of the pipe and turn the cable on and off to provide the most economical solution for frozen pipe disasters. How it Works Before applying the heating cable, make sure that the area on and around the pipe is clear and that the heating cable is warm and pliable. Simply plug the cable into the nearest grounded electrical receptacle, secure the thermostat tightly against the pipe with electrical tape, secure the heating cable straight along the pipe, and let the heating cable work its magic. The built-in thermostat will automatically detect the temperature of the pipe and turn the cable on when exposed to temperatures below 38F for frost-free pipes all winter long. It will shut the heating cable off when the pipe has been heated to a temperature of approximately 45F, incurring no extra electricity costs.